Canadian gamers who enjoy co-op gaming but for some reason don’t own an Xbox 360 (or maybe they need a second console!) are in for a treat. A limited-edition 250 GB Xbox 360 bundle which comes with a whopping five 360-exclusive games has just debuted in the land of maple syrup for the low price of $299.99 CDN. 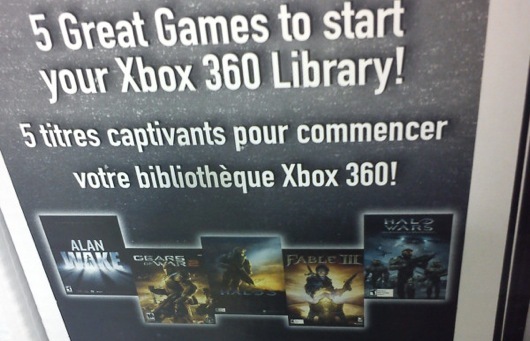 The bundled games include: Alan Wake, Gears of War 2, Halo 3, Halo Wars, and Fable III. Four out of five co-op games isn’t bad at all. The games are actually download tokens, which means they’ll take up 29.51 GB of hard drive space when installed. Plus there are the caveats that downloadable Alan Wake doesn’t come with the retail-bundled DLC and Halo 3 doesn’t run as well from a hard drive as it does from a disc. But cost-conscious gamers probably won’t mind when they have a brand new slim system and a big bundle of games to play on it. Page created in 0.2709 seconds.